Indian Khana, Made Easy: Last Sunday was National Ice Cream Day?? Can you name all the flavors?? Answers below. I didn't know that! Don't fret all, I celebrated it today when I stopped at my local grocer and bought myself two pints of Haagen Dazs ice cream: Coffee and Rum Raisin. I couldn't let this holiday go by unnoticed. Did you know that the National Ice Cream Day and Month were designated by President Ronald Reagan? I didn't. I thought it was one of those holidays made up by yet another company trying to sell something. According to IDFA, President Reagan recognized ice cream as a fun and nutritious food that is enjoyed by 90% of the nation's population. My question is what happened to the other 10%? Who doesn't like ice cream? In President Reagan's proclamation of creating this National Ice Cream Day, he called for all people of the United States to observe these events with "appropriate ceremonies and activities." Don't worry Mr. Past President, we will! 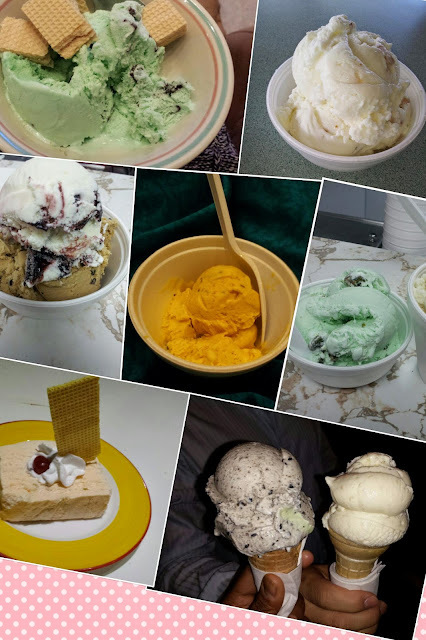 From top to bottom, here are all the flavors: Mint Chocolate Chip, Macadamia Nut, Cherries & Vanilla on top of coffee & Espresso chip ice cream, Mango kulfi (Indian ice cream), Mint, Tutti Fruti (Indian ice cream), cookies and cream and coconut. There's still time for you to celebrate National Ice Cream Month - it's only July 28th! What are you waiting, go grab some ice cream! !